2015 has gotten off to a pretty good start for longtime SCGA member Jeff Fortson. First, Fortson, a three-time U.S. Mid-Amateur competitor, earned medalist honors at the U.S. Four-Ball qualifier at Goose Creek GC in March. He teamed up with partner Michael Walton to shoot an 8-under-par 63 to capture a spot in the inaugural USGA event. 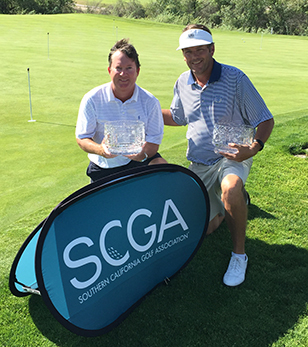 Then, yesterday, Fortson partnered with Rob Foster to win the 2015 SCGA Foursomes Championship, the first SCGA title for both men, who have competed in numerous SCGA events over the years. After an opening round 4-over-par 76 on the Bear Creek GC course, the duo came back to shoot 2-over-par 74 on Tuesday to end play in a three-way tie for first place. Also in the playoff was the duo of David Ober and Mackeever Tedford and SCGA veterans Tim Hogarth and Corby Segal. After the first hole of the playoff, the duo of Hogarth/Segal were eliminated after the other two teams birdied. The other two teams bogeyed the second playoff hole to force the competition to continue. During the play of the third playoff hole, Ober discovered he had 15 clubs in his bag. As this is a violation of Rule 4-4a, the duo of Ober/Tedford incurred a two-stroke penalty, which is applied to the first playoff hole, thus retroactively making Foster/Fortson the champions, since they had recorded the lowest score on that hole. The round of the day Tuesday, however, came off the clubs of Jordan Guillen and Cody Hall, who fired a sizzling round of 3-under-par 69. The duo had five birdies and one eagle in Round 2 to finish the tournament tied for fourth. They had opened the tournament with a 10-over-par 82. The SCGA Foursomes Championship is the first event of the year on the 2015 SCGA Championship calendar. It is open to two-person teams, with each player having a Handicap Index of 6.4 and below. The format is alternate shot with one player teeing off from the odd-numbered holes and the partner teeing off from the even holes. Next up, the SCGA Mid-Am Championship will be contested April 6-7 at Santa Ana CC.